Music ministry opportunities are available for all ages. Come share your talents! – For any and all adults! Starting on September 5, we rehearse on Wednesday evenings and usually sing at the 10 a.m. service. – For all women who would like to participate. We usually have several weeks of practice before we sing at the 10 a.m. service. Practices: Sundays at 9:00 a.m.
singing in church when they are ready! Practices: Sundays at 11:00 a.m.
– This fun group of ding-a-lings previously rehersed on Wednesdays from 7 – 8pm. Beginners and experienced are all welcome. Please contact Holly if interested. – Play an instrument or want to participate in special music? Share your talent! Please contact Bob Leggett. 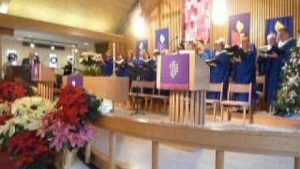 CLICK HERE to watch the video of the fourth Sunday of Advent 2016 service, Lessons and Carols, the telling of the Christmas story through Bible readings, choral music, and congregational singing.